Background Traditionally, hospital pharmacists’ roles have been associated with dispensing medications prescribed by doctors and offering advice about medicines to patients and other healthcare professionals. In England, significant changes in the structure of hospital pharmacy practice began in the 1970s and currently hospital pharmacists are undertaking a number of advanced roles including prescribing. 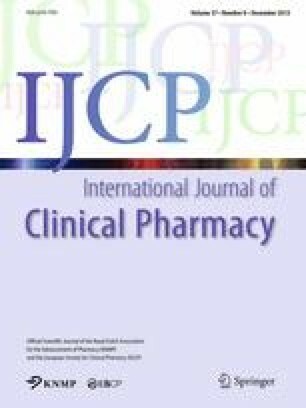 Objective This study investigated the facilitators to change in hospital pharmacy practice in England in order to identify lessons that might assist in the potential changes needed in other countries for extended clinical roles. Setting The study was conducted in England. Methods A qualitative study using semi-structured interviews was conducted with 28 participants, comprising 22 pharmacists and 6 pharmacy technicians from England. They were recruited through a snowball sampling technique. Transcribed interviews were entered into the QSR NVivo 10 software for data management and analysed thematically. Main outcome measure Pharmacists and pharmacy technicians’ perception of the facilitators to hospital pharmacy practice change in England. Result Three major themes emerged from this study: drivers for change, strategies for change and efficiency. Many of the drivers identified were linked to changes in the structure of hospital pharmacy including education and training; specialisation in practice and career structure. Strategies employed to achieve practice change included broadening the role of pharmacy technicians in order to free-up pharmacists’ time; seizing opportunities for extended roles; developing a relationship with the medical profession and professional leadership influence. Participants perceived that the development of pharmacists’ clinical roles have resulted in a more efficient healthcare provision where patients were offered seamless services. Conclusion Changes in the professional structure of pharmacy including education and training, specialisation, career structure and the roles of pharmacy technicians could benefit the development of pharmacists’ clinical roles in other countries. The authors are grateful to all the participants of this study. Smith A, Darracott R. Review of pharmacist undergraduate education and pre-registration training and proposals for reform: Discussion paper. 2011, Modernising Pharmacy Careers Programme: Medical Education England. http://hee.nhs.uk/healtheducationengland/files/2012/10/Pharmacist-pre-registration-training-proposals-for-reform.pdf. Accessed 11 Oct 2014. Canadian Pharmacists Association. CPhA position statement on a Doctor of Pharmacy degree as an entry-level to practice. 2011. http://www.pharmacists.ca/cpha-ca/assets/File/cpha-on-the-issues/PPDoctorOfPharmacyEN.pdf. Accessed 12 Jun 2014.
International Pharmaceutical Federation. FIP global pharmacy workforce report. The Hague: Fédération Internationale Pharmaceutique (FIP), 2012. http://www.fip.org/files/members/library/FIP_workforce_Report_2012.pdf. Accessed 13 Jul 2014.
Review of prescribing, supply & administration of medicines. Final report. 1999. http://webarchive.nationalarchives.gov.uk/20130107105354/http:/www.dh.gov.uk/prod_consum_dh/groups/dh_digitalassets/@dh/@en/documents/digitalasset/dh_4077153.pdf. Accessed 23 May 2013.